As I’ve said on my About page, I’m a history junkie and science geek. I love the intersection of these two disciplines: DNA markers that trace humankind’s exodus from Africa, isotope analysis of teeth and bones that tell us where and when ancient people grew up and what they ate, UV light to fluoresce bones and fingerprints on artifacts, and much more. Over half of my “history in the news” stories this round up have a major science component–from what really killed people in Pompeii to discovering a “lost” Roman city from aerial photographs to where the Dead Sea Scrolls were manufactured. You can click on the links to see the original stories. We’ll start with Pompeii. 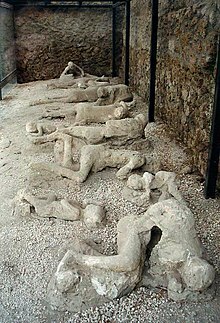 Most historians and archaeologists believed the people at Pompeii, who where not killed by spewing rocks, died of suffocation from ash and poisonous gas. Pliny the Younger described the process in letters written 25 years later. Giuseppe Mastrolorenzo, a vulcanologist from the Naples Observatory claims “Everything that has been written in the guides, and the texts, and that has been re-told to tourists [about how people died at Pompeii] is false.” He spent years analyzing skeletal casts, testing bone tissue and simulating Vesuvius eruptions. He published his findings in the science journal PLoS One. Mastrolorenzo concludes that the people of Pompeii were instantly killed by a pyroclastic cloud, a surge of super-heated air. He also proved these high temperatures can be carried up to 12 miles away from the volcano. The Italian Civil Protection requires only those people living five miles from Vesuvius to evacuate, which puts 3 million people in and around Naples in harm’s way, in case of another eruption. Science had a major part in discovering several Roman-occupied sites in the recent news. In Caerleon, in south Wales, one of Britain’s best known Roman sites, students learning to use geophysical equipment outside the fort, discovered several previously unknown buildings. They may include baths and temples and are the first evidence of Roman plans to develop Caerleon (known as Isca when it was founded in AD 75) into a major settlement. Dr. Peter Guest, a senior lecturer in Roman archaeology at Cardiff University said, “The biggest is enormous and must be one of the largest buildings known from Roman Britain. We can only guess what it was for, but at the moment we’re working on the idea that it had something to do with a harbor on the river, although it does look uncannily like a residential villa building – if that’s the case it was built on a palatial scale.” The site is open to the public with guided tours and contains a 150 year-old museum dedicated to Roman artifacts. Aerial photos from a police surveillance plane show, what is believed to be, part of the mysterious city of Pausulae located near the eastern Italian city of Macerata. Pausulae is described by Pliny the Elder and is believed to date from the late 2nd century BC. The photos showed a large ancient Roman settlement with roads and buildings containing quadrangles and columns; all enclosed by thick walls. German archeologists from the Archeology Institute in Frankfurt used geomagnetic and geophysics methods to search at the site of the ‘Felix Romuliana’, an imperial palace near the Town of Zajecar in the Balkans. They’ve discovered about fifty objects including a sculpture symbolizing victory by Rome over barbarians. A fragment, believed to be Diana on a horse, is missing. The ‘Felix Romuliana’ contains numerous floor mosaics and remains of monumental temples and buildings. Recent finds include a portrait of Emperor Galerius and statuary heads of Hercules and Jupiter. The German experts have agreed on a plan to cooperate with colleagues of the Archeology Institute in Belgrade to continue excavating in the area. And finally in our science related roundup we have the story from the Italian National Institute of Nuclear Physics (INFN) in Catania, Sicily. Researchers there used proton beams to analyze tiny pieces of parchment from the Temple Scroll (of the Dead Sea Scrolls.) “We selected the fragments from the Temple Scroll because they were the cleanest, and would make our analysis easier,” INFN physicist Giuseppe Pappalardo said. Pappalardo and his colleagues used a new portable technique called “XPIXE” — X-ray and Particle Induced X-ray Emission and a particle accelerator to study the fragments. The X-rays emitted by the samples showed that the ratio of chlorine to bromine was about three times higher than is normally found in sea water. The researchers concluded that the parchment from the scroll may have been made using the very salty Dead Sea water near where the document was found in Qumran. Next they are going to study the ink. To round out the round up—a couple of old stories and a couple of new. In western Turkey: Ongoing excavations at the ancient city of Heraion-Teikhos have unearthed a Thracian temple at the city’s acropolis, a square tower with two-and-a-half-meter-deep walls, tumulus graves and evidence of dog sacrifice. According to the excavation chairwoman, Professor Neşe Atik from Ahi Evran University’s archaeology department, “there had been a holy place here since the 6th century. This magnificent temple was built in the 2nd century…Dogs were sacrificed for good luck in this period. We saw light yellow spots in the earth when we first started the excavations. And then we found oblation valleys. We found the head of a bull last year.” They’ve discovered statues of gods including Kybele, Eros and Aphrodite as well as bronze coins and amphora. This year, they plan to excavate one or two undisturbed graves to prove or disprove Herodotus’ story that Thracian men were buried with their wives. A team from the Varna Archaeology Museum discovered what might be an ancient winery at a fortress (dating from Late Antiquity-Early Byzantine era) on Bulgaria’s northern Black Sea coast. The buildings consist of two stone structures connected through a wooden passage. One of them would probably be filled with grapes then pressed with large rectangular stones. Professor Valeri Yotov, the head of the team, explained that other buildings thought to be ancient wineries have been found in Bulgaria but their function isn’t known for sure. Tests on this site might make it the first conclusively identified ancient winery in the country. From the Coliseum we turn to modern gladiators. Twenty students from Regensburg University in Germany have embarked on an experimental archaeology project. They’ve set up camp, living in tents without beds or other comforts, in the former Roman city of Carnuntum in Austria. Here they hope to find out how gladiators trained and battled in their bloody spectacles. A team of archaeologists, sports scientists and psychologists will measure how their training changes their bodies, and whether it has an effect on their aggression levels. Christian Eckert, the group’s trainer, said “some of them were incredibly unfit” when he started coaching them in March. By the time they came to Carnuntum, they were able to bear the more than seven hours of training lifting logs, sword fighting and boxing. The young men eat mostly food made from lentils, other pulses and cereals, a diet that earned their ancient colleagues the nick-name ‘grain munchers.’ Archaeologists, studying gladiator skeletons, believe this diet led to a speedier recovery from bone fractures.